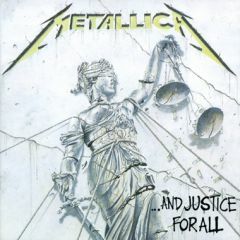 Unleashed in 1988, Metallica's And Justice For All marked the band's gear-shift from underground heroes to the major league. Containing the band's first Top 40 single, the horror- filled 'One', the album's hard-hitting lyrics and darkly intense feel delighted their ever-growing fanbase, reaching Number Six on the Billboard chart. This four-LP limited-edition is remastered at half speed for unbeatable sound. This Product was added to our catalogue on Thursday 14 June, 2012.